This year, I was organised, I was smooth, and I had it all planned. There is nothing worse than making kids wait in line for a Santa photo, trying to keep them neat, clean, and in a good mood to smile at the fat man. I sent hubby up an hour before the photo's opened to jump in line, and spent that time at home feeding and watering my offspring before getting them ready. Lolly looked beautiful, like a little gold angel in her dress from Bardot Junior that will feature at any Christmas related gatherings this year. I set 11 year old Maddy the task of keeping an eye on her (not that difficult in a playroom filled with toys) while I packed the baby bag. A few minutes before it was time to leave the house to join husband at the head of the photo queue, I went hunting for my suspiciously quiet toddler. Maddy was absorbed in a book, and looked at me with guilty eyes as I started the search through Lolly's hiding places. Finally I ran her to earth in my bedroom. Sitting on the floor covered in a pot of green paint that came from Spotlight via the fabulous Kidsbusiness Bloggers brunch that I had set aside to ponder it's Christmas uses. Lolly had found it. 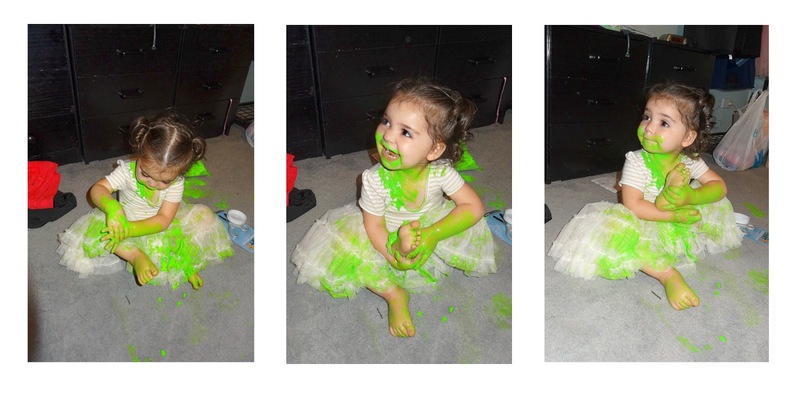 Turns out the pot of paint didn't come with a safety seal, and the lid was incredibly kid friendly. THANKS SPOTLIGHT lol! Hubby was retrieved from the shop where he was quite embarrassed to be at the front of the line of 1. Yes 1. Turns out the Harvey Norman free photo isn't the drawcard that the $35+ Westfields photo's are and there was no line up. How was I supposed to know? Every year the local shopping centres always have massive lines on Saturdays, so I assumed that Harvey Norman (part of the shopping centre complex) would be the same! The dress was thrown through the machine and has come out as good as new. So, OK, really thanks Spotlight, because the stuff washed out really well which I didn't expect. Not so well out of my carpet though which now has a faint lime sheen to it. The end result a few hours later after no line at all (and a slightly incredulous Harvey Norman staff member who struggled to understand that I am genuinely enough of a tight arse to take the free package and not be shamed into buying at least the $10 package), we ended up with this. I'm happy! Harvey Norman printed out 3 copies for us at no charge, one for us, and one for the Grandparents. Conclusion? Don't waste your money on expensive photos......and don't turn your back on your toddlers for a second! That is so funny! Maybe she was going for a very shrek christmas look? We where at Harvey Norman last weekend and it was like a graveyard. Santa rang his bell excitedly as I approached with the boys but they wouldn't have a bar of him. Ha! It's always when they're quiet... And good on you for standing your ground with the photo package!!! Oh that is too funny, she looks so pleased with herself! 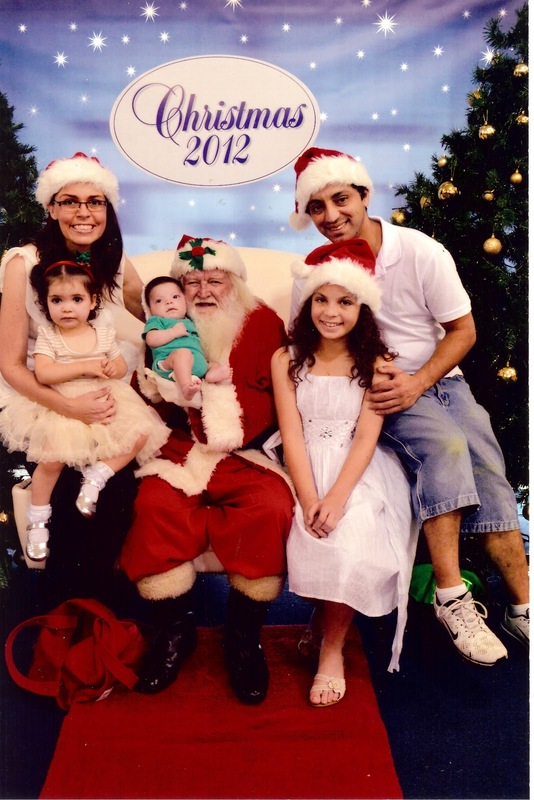 Our local, very small shopping centre has a Santa where you go to meet him, take your own camera and take your own photo. Free, free, free! Some people I know around here have spent hours lined up and paid big bucks to get a Santa photo even though they can take their own for free which I think is crazy. Why pay for something you don't have to? That is the best idea - I saw an outdoor one today provided by our local council sitting in the most beautiful chair surrounded by gardens. If I'd seen him before I probably would have gone to him for the photo because he had a pretty friendly elf that probably would have taken it for us!